It’s been quite a while since I’ve played along with My Creative Space, but I thought it might be fun to show you what I’m working on at present. 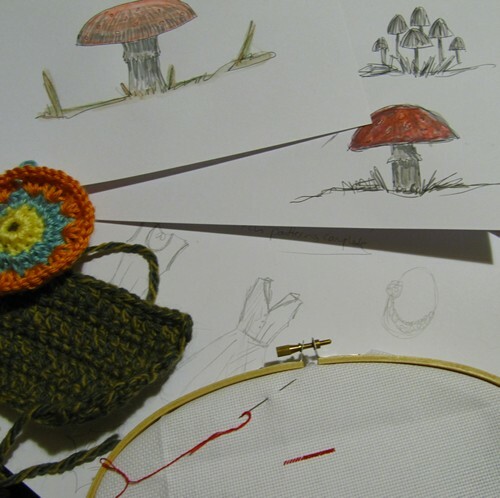 Toadstool sketches- I’m working on a collection of toadstools in different mediums. The sketches are just practice pieces done in Pitt markers with water colour pencil, the cross stitch at the front is also a piece to go in the collection. Crochet- the beginnings of a neck warmer and a hexie blanket. Patterns can be found here and here. Sketch pad – some dress and jewellery ideas I’ve been sketching with the intent to actually make them. You might also make out a note in the shadows that says ‘patterns complete’. The full note says ‘x-stitch patterns complete’ and refers to completing some beautiful pieces from patterns I purchased from Penelope Waits. Go have a look – her designs are gorgeous! Above that note (hidden from view) is a lengthy list of other things I’m working on. Why don’t you head over to Kootoyoo and join in too?